Now's the time to pickup a copy of Metroid Prime Trilogy, because it might not be too easy to find in the near future. Mysterious decisions continue to come from the house that plumbers, monkeys, and sword-wielding elven boys built. Not content to continue giving consumers a good deal with Metroid Prime Trilogy for the Wii, the game has been discontinued by Nintendo and new copies are no longer being shipped out. Metroid Prime Trilogy was originally priced at $49.99, came in a shiny hard metal case, and the disc not only contained the Wii-exclusive Metroid Prime 3: Corruption but also the Gamecube originals Metroid Prime and Metroid Prime 2: Echoes. The Metroid Prime series brought Samus into the third dimension, and did it well as the games are all critically acclaimed. Metroid Prime Trilogy also added the Wii Remote control scheme of Prime 3 to Prime and Prime 2, along with visual and gameplay enhancements. Coffee With Games had noticed that the game wasn't showing up on Amazon any longer, and contacted Nintendo with a query as to why. Surprisingly, Nintendo replied: "Unfortunately, Metroid Prime Trilogy is no longer being shipped. Having said that, you may be able to find what you seek through the secondhand video game market." When asked for further clarification, Nintendo's second reply was: "The earlier response regarding Metroid Prime Trilogy was correct: it is no longer being shipped. When first introduced, it was announced that there would be limited availability. However, a reason for this was not announced. That being said, you may still be able to locate a copy via stores that specialize in previously played or used games." Nintendo did also say that other "New Play Control" titles (Gamecube ports brought to the Wii with enhancements) are still being shipped, just not Metroid Prime Trilogy. 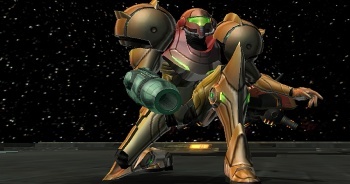 So, not only is Metroid Prime Trilogy dead, Nintendo recommends that it be bought used. This seems awfully strange, though maybe the Nintendo rep was just trying to offer a helpful suggestion to a consumer. The reason could be poor sales, or due to Nintendo wanting to release Prime and Prime 2 as stand-alone "New Play Control" titles like it did with Pikmin and Mario Power Tennis. Or, Nintendo could be trying to distance itself from the first-person versions of Metroid to prepare for the more traditional Metroid: Other M.